Old Italic is one of several now-extinct alphabet systems used on the Italian Peninsula in ancient times for various Indo-European languages (predominantly Italic) and non-Indo-European (e.g. Etruscan) languages. The alphabets derive from the Euboean Greek Cumaean alphabet, used at Ischia and Cumae in the Bay of Naples in the eighth century BC. Various Indo-European languages belonging to the Italic branch (Faliscan and members of the Sabellian group, including Oscan, Umbrian, and South Picene, and other Indo-European branches such as Celtic, Venetic and Messapic) originally used the alphabet. Faliscan, Oscan, Umbrian, North Picene, and South Picene all derive from an Etruscan form of the alphabet. The Germanic runic alphabet may have been derived from one of these alphabets by the 2nd century AD. Etruscan cippus (grave marker) from the necropolis Crocifisso del Tufo outside Orvieto, Italy, side view showing the inscription in the Old Italic (Etruscan) alphabet. The Etruscan alphabet originated as an adaptation of the Western Greek alphabet used by the Euboean Greeks in their first colonies in Italy, the island of Pithekoussai and the city of Cumae in Campania. In the alphabets of the West, X had the sound value [ks], Ψ stood for [kʰ]; in Etruscan: X = [s], Ψ = [kʰ] or [kχ] (Rix 202–209). 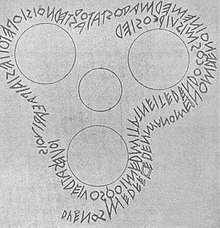 The earliest Etruscan abecedarium, the Marsiliana (near Grosseto, Tuscany) tablet which dates to c. 700 BC, lists 26 letters corresponding to contemporary forms of the Greek alphabet which retained digamma, san and qoppa but which had not yet developed omega. Comparison of the Western Greek alphabet with archaic and classical Etruscan variants. An additional sign 𐌚, in shape similar to the numeral 8, transcribed as F, was present in both Lydian and Etruscan (Jensen 513). Its origin is disputed; it may have been an altered B or H or an ex novo creation (Rix 202). Its sound value was /f/ and it replaced the Etruscan digraph FH that was previously used to express that sound. Some letters were, on the other hand, falling out of use. Etruscan did not have any voiced stops, for which B, C, D were originally intended (/b/, /g/, and /d/ respectively). The B and D therefore fell out of use, and the C, which is simpler and easier to write than K, was adopted to write /k/, mostly displacing K itself. Likewise, since Etruscan had no /o/ vowel sound, O disappeared and was replaced by U. In the course of its simplification, the redundant letters showed some tendency towards a semi-syllabary: C, K and Q were predominantly used in the contexts CE, KA, QU. This classical alphabet remained in use until the 2nd century BC when it began to be influenced by the rise of the Latin alphabet. The Romans, who did have voiced stops in their language, revived B and D for /b/ and /d/, and used C for both /k/ and /g/, until they invented a separate letter G to distinguish the two sounds. Soon after, the Etruscan language itself became extinct. 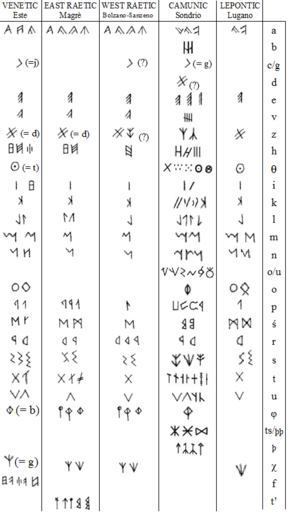 The Osci probably adopted the archaic Etruscan alphabet during the 7th century BC, but a recognizably Oscan variant of the alphabet is attested only from the 5th century BC; its sign inventory extended over the classical Etruscan alphabet by the introduction of lowered variants of I and U, transcribed as Í and Ú. Ú came to be used to represent Oscan /o/, while U was used for /u/ as well as historical long */oː/, which had undergone a sound shift in Oscan to become ~[uː]. The Nucerian alphabet is based on inscriptions found in southern Italy (Nocera Superiore, Sorrento, Vico Equense and other places). It is attested only between the 6th and the 5th century BC. The most important sign is the /S/, shaped like a fir tree, and possibly a derivation from the Phoenician alphabet. The alphabet does not distinguish voiced and unvoiced occlusives, i.e. P represents /b/ or /p/, T is for /t/ or /d/, K for /g/ or /k/. Z is probably for /ts/. U /u/ and V /w/ are distinguished. Θ is probably for /t/ and X for /g/. There are claims of a related script discovered in Glozel. The alphabet of Sanzeno (also, of Bolzano), about 100 Raetic inscriptions. The alphabet of Magrè (near Schio), east Raetian inscriptions. Alphabet of Este: Similar but not identical to that of Magrè, Venetic inscriptions. Inscribed abecedarium on rock drawings in Valcamonica. ⟨.⟩ is a reduced ⟨o⟩ and ⟨:⟩ is a reduced ⟨8⟩, used for /f/. The Old Italic alphabets were unified and added to the Unicode Standard in March, 2001 with the release of version 3.1. The Unicode block for Old Italic is U+10300–U+1032F without specification of a particular alphabet (i.e. the Old Italic alphabets are considered equivalent, and the font used will determine the variant). Writing direction (right-to-left, left-to-right, or boustrophedon) varies based on the language and even the time period. For simplicity most scholars use left-to-right and this is the Unicode default direction for the Old Italic block. For this reason, the glyphs in the code chart are shown with left-to-right orientation. ^ Benelli, Enrico (2017). "Alphabets and language". In Naso, Alessandro. Etruscology. Berlin, Germany: Walter de Gruyter. pp. 245–253. ISBN 9781934078495. ^ a b Ager, Simon (1998–2018). "Etruscan alphabet". Omniglot. ^ Stuart-Smith, Jane (2004). Phonetics and philology: sound change in Italic. Oxford: Oxford University Press. Bonfante, Giuliano and Larissa Bonfante. The Etruscan Language: An Introduction. Manchester: Manchester University Press, 2002. Mullen, Alex. Southern Gaul and the Mediterranean: Multilingualism and Multiple Identities in the Iron Age and Roman Periods. Cambridge: Cambridge University Press, 2013. Wikimedia Commons has media related to Italic letters. Wikimedia Commons has media related to Etruscan alphabet. Wikimedia Commons has media related to Nucerian alphabet. Etruscan Texts Project: A searchable online database of Etruscan inscriptions.